Draw closer to god in just 2 minutes per day! 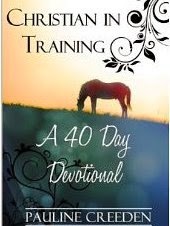 This series of short 2-minute devotions relates the Scriptures to Horsemanship, giving the reader and rider a new insight into God's word. Even if you have no experience with horses whatsoever, you can glean amazing insight into the workings of God through your relationship with Him. First begun as a weekly devotion in "More From Ruby" - the website addition from RUBY FOR WOMEN Magazine. To say this is an excellent devotional for horsemen and women is such a huge understatement that I am loathe to try to qualify it at all. I didn't know what to expect when I started reading; maybe something cutesy and trite, but I did not expect the depth of insight author Pauline Creeden infuses into these forty chapters. I am a follower of Jesus and I am intimately knowledgeable about horses and horse training, so this book is right up my alley.